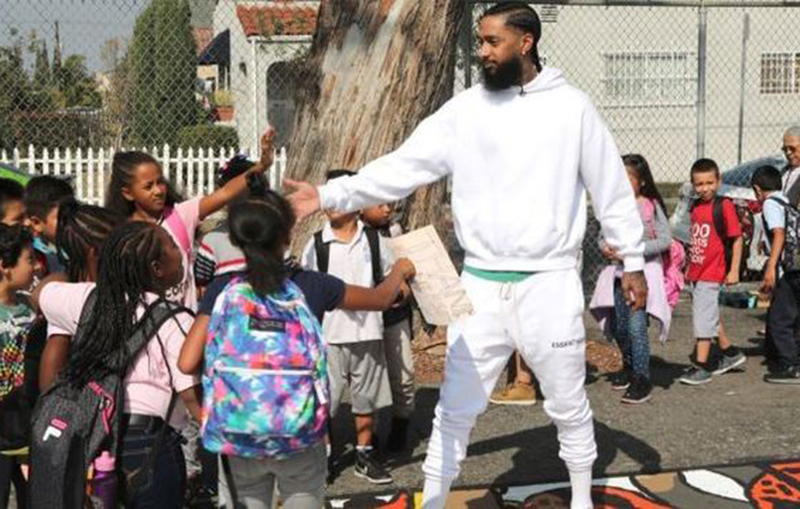 Nipsey Hussle in South L.A.
Years ago, a popular burger joint in Nipsey Hussle’s South Los Angeles neighborhood had high-top tables but no chairs. “I remember that, being young feeling like, ‘How dare you?’” Hussle recounted last month to the music blog Genius. So Hussle, born Ermias Asghedom, bought the building. This story illustrates how the 33-year-old rapper, who was shot to death outside of his clothing store on Sunday afternoon, fought for the black and Latino people of his neighborhood of Hyde Park. Long before Hussle was nominated for a Grammy, he was a champion of South L.A. and had been planning to buy back the ‘hood — and in recent months, he was succeeding. In January, Hussle and real estate investor David Gross bought an L-shaped shopping center off Slauson Avenue — the one that houses Master Burger and Hussle’s store, The Marathon Clothing — for $2.5 million, according to property records. Hussle and Gross, a South L.A. native, met at a Lakers game several years ago and bonded over tequila. In the future, the business partners had hoped to buy more properties. There was a sense of urgency. The Hyde Park neighborhood where Hussle grew up is on the cusp of change. Construction of a new Metro line, which will cut through Crenshaw Boulevard and connect to Los Angeles International Airport next year, has caused housing prices to rise, pushing people out and leading to fears of gentrification. All around Hyde Park, development is booming — from the planned redevelopment of Baldwin Hills Crenshaw Plaza to the north to the NFL stadium in Inglewood to the south. But, so far, what was Hussle’s pocket of South L.A. has seen little such investment. Doughnut shops, car washes and repair shops flank the churches, schools and empty lots that line the stretch of Slauson Avenue around the shopping center. Missing are the hip eateries and trendy boutiques that dot wealthier parts of Los Angeles. “We didn’t see enough of us behind the counters or owning the building,” said Marquesha Lawson, 34, a friend of Hussle’s since they both attended Watts Middle School. Hussle dreamed of more for his neighbors. Owning the shopping center off Slauson Avenue was one of the first steps. A decade ago, he was selling socks and T-shirts in that parking lot at 3416 W. Slauson Ave. Years later, he earned enough money to lease space there to house his store, Slauson Clothing. Then in 2017, he opened his flagship store, The Marathon Clothing — now the anchor tenant, nestled in the middle of the shopping center. It was outside that store that Hussle and two others were gunned down on Sunday. He was shot multiple times by a young man who police said opened fire at close range before running to a getaway car. On Monday, all of the shopping center’s businesses — the burger joint, a barbershop, a fish market, a tax agency — were closed. But the parking lot was packed with people of all ages and races, paying tribute to the fallen hip-hop star. One woman walked the perimeter of the plaza brandishing a burning stick of sage. A crew of bicyclists stopped in the street to watch. On Monday evening, a vigil for Hussle in the parking lot ended in a stampede. A Los Angeles Fire Department official said more than a dozen people were transported to hospitals, including two in critical condition. On most days, The Marathon Clothing, with its large picture windows and string lighting, looks as though it belongs on the trendy strip of Fairfax Avenue or Melrose. But it is in South L.A.
Two miles away, off Western and Slauson avenues, Hussle and Gross last year opened a co-working space, Vector 90, to encourage people in South L.A. to pursue careers in math and science, and to serve as a conduit between Silicon Valley and residents. Hussle and Gross had plans to acquire enough land to build a residential and retail complex in Hyde Park, with 80 units of apartments and condos on top of shops with healthful food options. Hussle didn’t want to have tenants as much as promote homeownership and entrepreneurship by allowing people to co-invest in the property. If all went as Hussle had planned, their mixed-use development would’ve been steps from the new Metro stop in Hyde Park, which is expected to showcase a community art project called Destination Crenshaw that the rapper had also been instrumental in getting off the ground. Hussle’s entrepreneurial vision extended even beyond South L.A. Gross said he had set his sights on creating a private equity real estate fund using Opportunity Zone tax incentives, created as part of the Tax Cuts and Jobs Act of 2017 to encourage long-term investment in low-income urban areas. In a lengthy interview with Forbes magazine earlier this year, Hussle laid out his plan to use the tax incentives to put Marathon Clothing stores, barbershops and fish markets in cities across the country. Hussle stood out in the hip-hop industry — in which flashy cars and jewelry dominate music videos and social media pages — for turning his street hustle into legitimate businesses that helped the people in his neighborhood. Hussle’s rags-to-riches story, along with his desire to give back, endeared him to his community. Derrick Evans, 58, who traveled an hour on the bus from his assisted-care facility to pay his respects in Hyde Park on Monday, said Hussle was more than a rapper.